What about a planetary collision that has mostly destroyed both planets? This would produce a cloud that would blot out the sunlight in the periodic fashion as seen. This cloud would disperse over a period of time (centuries? millennia?) that could account for the dimming effect that has been observed. What would be the reason why this would not account for the observations? kurt9 wrote: What about a planetary collision that has mostly destroyed both planets? This would produce a cloud that would blot out the sunlight in the periodic fashion as seen. This cloud would disperse over a period of time (centuries? millennia?) that could account for the dimming effect that has been observed. What would be the reason why this would not account for the observations? I suspect that explanation would share the same issues which discrdit the cloud of comets theory. Measuring the dimming of starlight as a planet crosses the face of its star during orbit, scientists can collect a wealth of information, even without ever seeing those worlds directly. Using methods that allow them to estimate the average stellar illumination and temperatures on their surfaces, scientists have already identified dozens of locations where life could potentially exist. If you wanted to contact another world the cheapest way would be to use your sun as a giant semaphore. Just as your planet shows against the sun The shading of the sun with a planet size blinder would show up as a easily detected sign that someone is there. Cheaper than radio or laser communications energy wise and cost wise. and all you would need as a technology level is something slightly higher than what we currently have. They discovered a 2nd "Dyson Swarm" but they think the explanation (for both) is that the stars are very young; that is what we are seeing is the accretion disc that is prominent in a young solar system is what we are observing edge wise. They initially argued that "Tabby's star"( the first one) was and "old" star which made the results puzzling; now they think it and the newly discovered one are both young stars; that changes everything. Since last October, an unusual star has baffled astronomers with strange dips in its brightness, prompting many to speculate about a possible alien 'Dyson sphere' megastructure that could be blocking the light. Along with these irregular fluctuations, scientists recently discovered that the entire star has dimmed by roughly 20 percent over the course of a century, further adding to the mystery. In a new explanation, however, an astrophysicist describes a scenario that could debunk the alien megastructure theory – and researchers may have found another star that fits the mold. The mysterious 'Dyson sphere' star may be in a newly discovered stage of evolution, he argues, with naturally occurring phenomena explaining the bizarre 'flux dips. kunkmiester wrote: Last I knew, the Dyson sphere came first--Niven suggested it as an intermediate between spheres and planets. He's actually here at World con, I could ask him. You don't really want to make anything on that scale rigid. It's not anyway, at least when you look at the scale involved. Despite its thickness, when you look at the ratios it's rather thin and narrow. Yes, the Dyson Sphere was proposed first, and Larry Niven though up the Ringworld as an easier/lower-tech version. Fans pointed out that the ring would be unstable without active stabilization, so he added that in the second book. Those same fans pointed out the tensile strength needed for the Ringworld to not rip itself to pieces through centripetal forces, thus Niven 'invented' skrith, the material the ring itself is made of. My speculative wild a$$ guess, the thing is a borderline black hole, literally fluctuates in and out of collapse condition. You know that ‘alien megastructure’ star? It’s back in action. 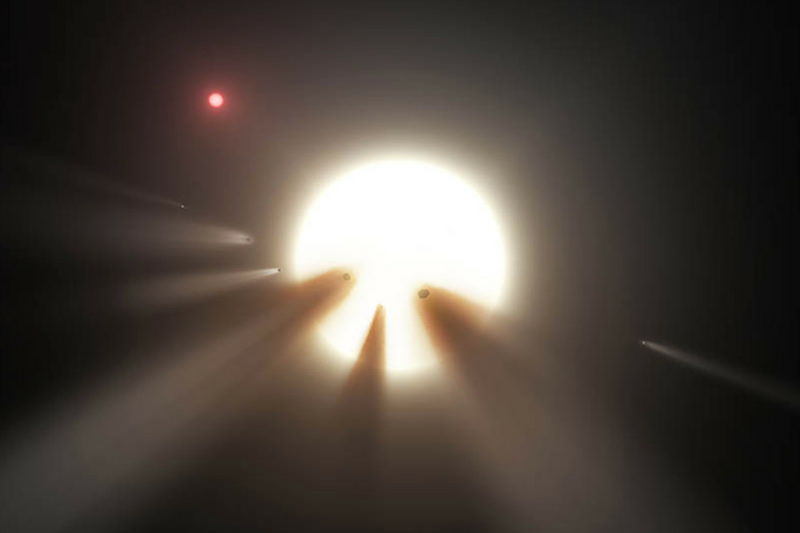 An illustration of the comets that may be blocking Tabby’s Star. It was early Thursday morning when astronomer Matt Muterspaugh noticed something strange with the star he had been observing for the last year and a half. Telescope data taken from the night before showed that the brightness of the star had dipped significantly. He contacted other astronomers who had also been observing the same star, to let them know what he had seen and to keep an eye on it for any more changes. Then by the following morning, the star had dimmed even more. That’s when he and the others knew it was time to signal the alarm: the weirdest star in our galaxy was acting weird again. And it was time for everyone to look at this distant celestial body — to figure out what the hell is going on. “As far as I can tell, every telescope that can look at it right now is looking at it right now,” Muterspaugh, a professor at Tennessee State University, tells The Verge. That’s why astronomers have been observing the star basically around the clock since they first learned of its dimming behavior. To do this, Boyajian started a Kickstarter campaign called “Where’s the Flux?” to secure funding for enough telescope time to continuously monitor the star. The campaign successfully raised more than $100,000, which helped Boyajian and others set up a year-long observation program through the Las Cumbres Observatory, which has telescopes stationed throughout the world. At the same time, Muterspaugh independently set up an observation campaign with the robotic telescopes at the Fairborn Observatory in Arizona. These telescopes are essentially automatic, observing certain targets in the sky on their own when the rest of us are sleeping. Muterspaugh had programmed one of these telescopes to constantly keep an eye on Tabby’s Star. And for the most part, the star has been quiet, behaving more or less like normal. Then on April 24th, data from Fairborn indicated that the star had dimmed ever so slightly. It wasn’t enough of a change for astronomers to think the star was acting up again, but everyone was still on their guard. There was an idea that this small dip could be a preliminary event before the real thing. And sure enough, nearly a month later, the huge dimming that Kepler saw seems to be happening again. And it’s really the moment that everyone has been waiting for with Tabby’s Star. It gives astronomers the opportunity to use their entire arsenal of telescopes to observe these fluctuations as they occur. Kepler only observed the light fluctuations in just one broad range of light colors. Now, we can use telescopes to observe the star’s light in numerous colors and light spectrums, and that can give us a better idea of the types of chemicals that are present when these changes occur or the properties of the objects that are blocking the light. For instance, if it is just a bunch of comets, then they’re going to be very close to the star and super hot, according to Jason Wright, and that’s something we can pick up by observing in the infrared spectrum. The star is acting weird but this time there seem to be a lot of people taking a little time out of the schedules to look so maybe we can get enough data to see something definitive. Something comes into our solar system from the general direction of one of the most likely habitable G5v start system with water worlds does a hard right around the sun another G5v star system with water worlds and heads towards pegasus another G5v star system with water worlds. in effect flying by or going to be flying by 3 of the 11 discovered planets with water closest to earth and the only sun like planets in the bunch. If I were a conspiracy nut I would be wondering right now what was up. On the other hand at the speed it was going it would take 100,000s of years just to make the trip using classical newtonian physics . Nobody,alien or earthwise got time for that, But because I am paranoid I would keep a eye on that rock to look for any change in velocity. kunkmiester wrote: You don't really want to make anything on that scale rigid. It's not anyway, at least when you look at the scale involved. Despite its thickness, when you look at the ratios it's rather thin and narrow. Nothing on any scale is "rigid". The universe is made of rubber. Of varying degrees of stiffness. Ask any precision machinist. I've made enough chatter to know that. Flexability relative, and Star Trek's depiction at least was not a very good one. Well it looks like we are back to dust again... but that still does not explain the brightening seen twice. paperburn1 wrote: Well it looks like we are back to dust again... but that still does not explain the brightening seen twice. 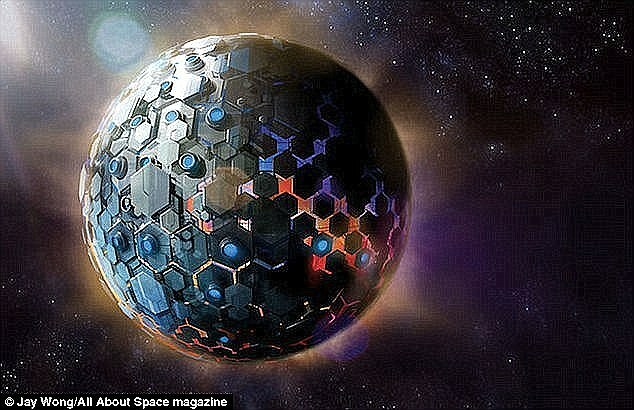 Some astronomers have speculated that the objects eclipsing KIC 8462852 could be parts of a megastructure made by an alien civilization, such as a Dyson swarm, a hypothetical structure that an advanced civilization might build around a star to intercept some of its light for their energy needs. According to Steinn Sigurðsson, the megastructure hypothesis is implausible and disfavored by Occam's razor and fails to sufficiently explain the dimming. However, he says that it remains a valid subject for scientific investigation because it is a falsifiable hypothesis. Due to extensive media coverage on this matter, KIC 8462852 has been compared by Kepler's Steve Howell to KIC 4150611, another star with an odd light curve that was shown, after years of research, to be a part of a five-star system. The likelihood of extraterrestrial intelligence being the cause of the dimming is very low; however, the star remains an outstanding SETI target because natural explanations have yet to fully explain the dimming phenomenon. The trouble with the improbable natural occurrence explanation for Tabby's star is you have to explain if the likelihood of such is so low, how on earth did we manage to detect it in the first place? Given are decidedly limited ability to observe the heavens it should have taken a much longer period of observation to observe such. We have no agreed upon data as to the likelihood of other technological civilizations currently active in our galaxy so we assign a largely arbitrary low probability to it. The thing is if it is a "dyson swarm" or similar construct there is no reason to assume there would only be one; if the builders can make one no reason over time they couldn't make many more. That would explain our "improbable" detection of such; if there are hundreds or thousands in the area odds would favor at least one would be oriented in such a way for us to stumble upon it. How is this for speculation. There is a smallblack hole or neutron star orbiting the visible star and it keeps the orbital debris from coalescing. Then, on occasion, it gravity lenses the star light toward earth. Going from memory, but I thought the issue was a-periodic dips in light, as opposed to increases?